Thank you for the arrangement of Mandom Corp. and Manoah Consulting, 20 beauty bloggers including me get to learn some REAL Japanese make-up tips which is in trend now! 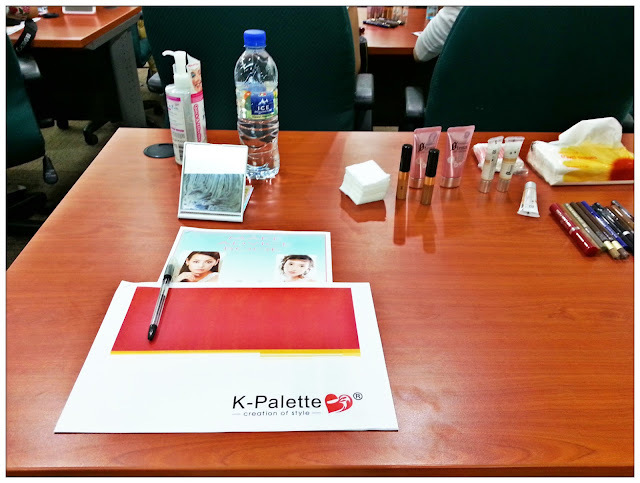 Took part in the K-Palette Beauty Workshop last weekend and learned some in-trend Japanese make-up tips which was taught to us by a 15 years experienced of professional make-up artist who flew all the way from Japan to Malaysia, such a great learning opportunity and I can't wait to share all these to you. 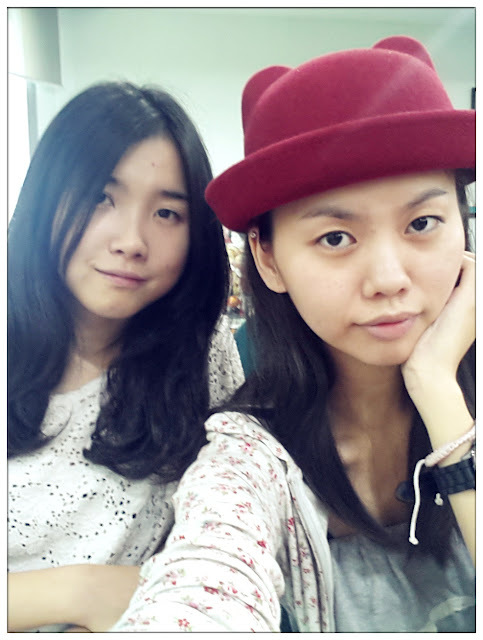 Went to the beauty workshop with Jean, and both of us were sick. *cough cough* Luckily the last two seats were at the back as we both are like two big walking bacterias which take turns to cough throughout the whole event that I feel so embarassed for attending the workshop under a bad condition. Gomen-nasai!!! Can we both turn to Japanese-ish good looking girls? Although am still feeling sick, but whenever I get in touch with tons and tons of make-up, I immediately become wide awake. 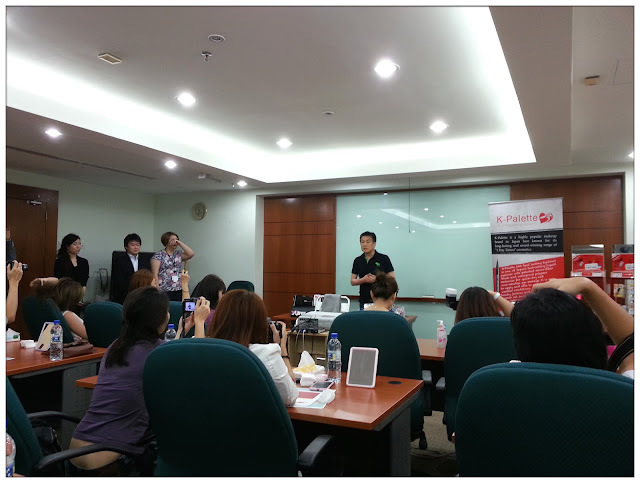 Get to experience all the awesome products from K-Palette chased away all the unwell feeling in me. Oooh la~la~ Tons of good stuff waiting for me to explore! 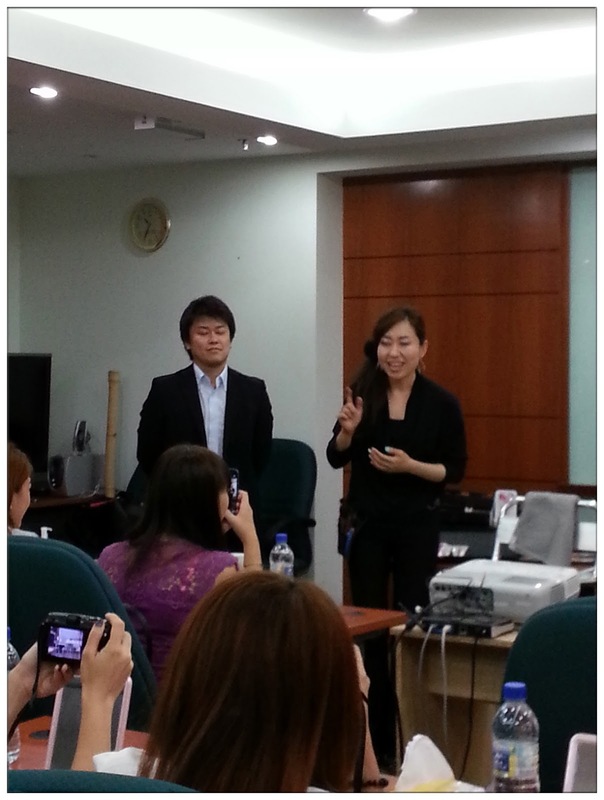 Here comes the superstar of the day - Ms. Inagaki and her translator Mr. Suzuki. It's quite fun to have all the friendly Japanese around. Suzuki-san's translation sometimes made us burst in laughter as well. Such a fun environment for us to learn and enjoy. Inagaki-san's 15 years of make-up experience made her a good tutor as well. She understands well about the needs of Asian women's skin and also make-up habit, which I felt very connected with all the things she said. 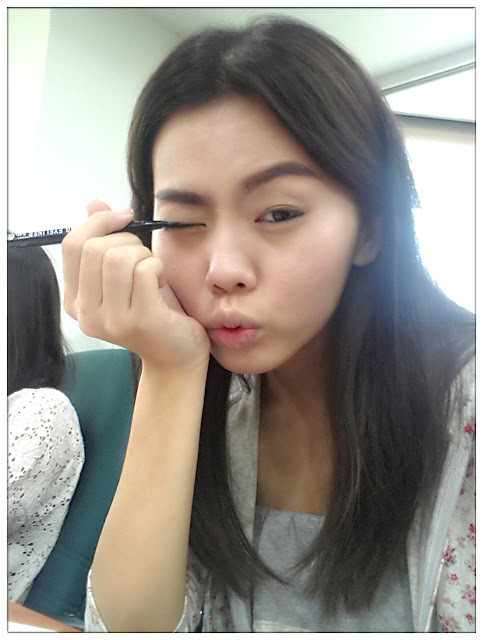 Let's start the make-up process! As usual, before you start the make-up process, it is a MUST to complete your skincare routine to ensure your skin are hydrated and moisturized so that your make-up will stay fit all day! That is one of the key point to have longer lasting make-up look from day till night. So don't be lazy to put on those toner, lotions, moisturizer and sunblock! This is my first time trying the products from K-Palette, and I must say that I am impressed by their awesomeness! 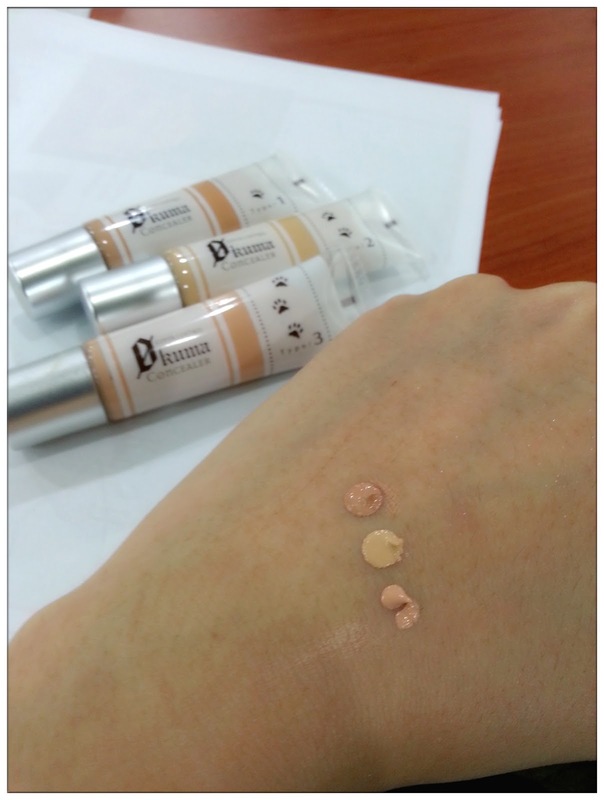 Their 0(Zero) Tema BB Cream light up my face instantly and their 0(Zero) Kuma Concealer comes in 3 shades to cater for different type of eye's dark circle needs. Both of these base make-up products made perfect fit to my skin, they are very light weighted and oil controlling, love it!!! While we're putting on 0 Tema BB Cream and conceal our dark eye circles, Inagaki-san drew two faces which indicates the cool type face and the cute type face. I'm the cool type face. 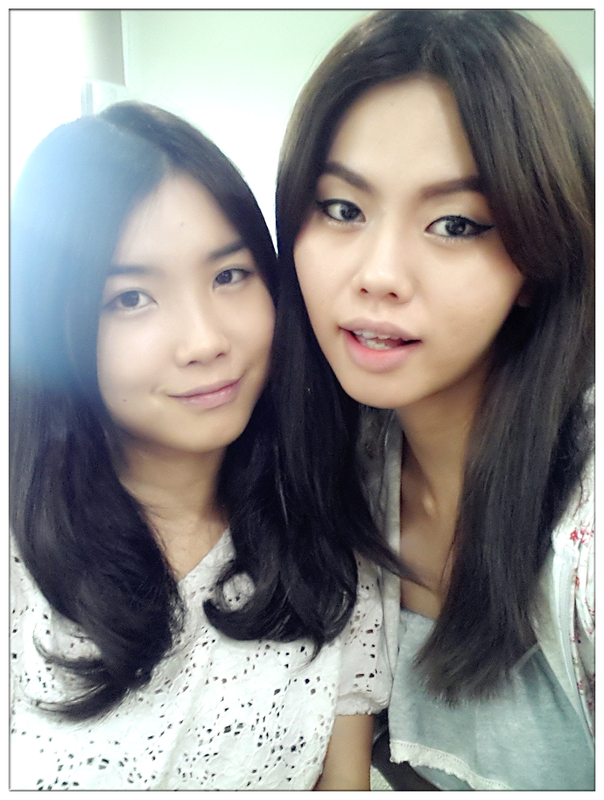 Tadaaa~ Basic foundation make done! Using 0 Zero Tema BB Cream and 0 Zero Kuma concealer. Inagaki-san define each of us what type of face we are, and which type of make-up we're suitable for. Although I'm cool type face, but it is also possible for me to do cute type of make-up once in a while, for the suitable occasion. Feeling a bit kawaii recently, don't really wanna look cool. lol. 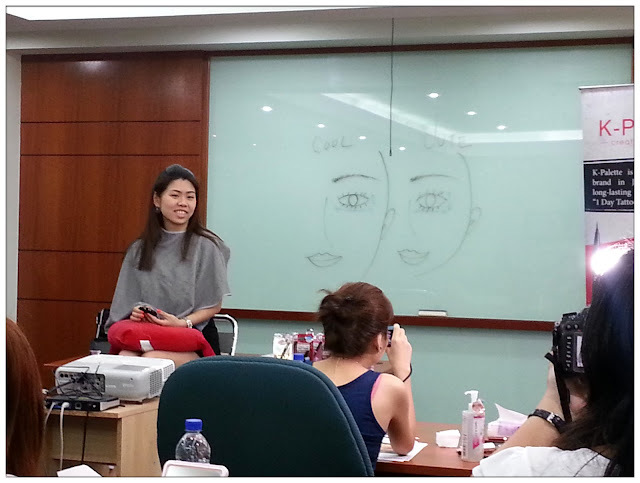 So let's define the make-up by drawing le eyebrows! 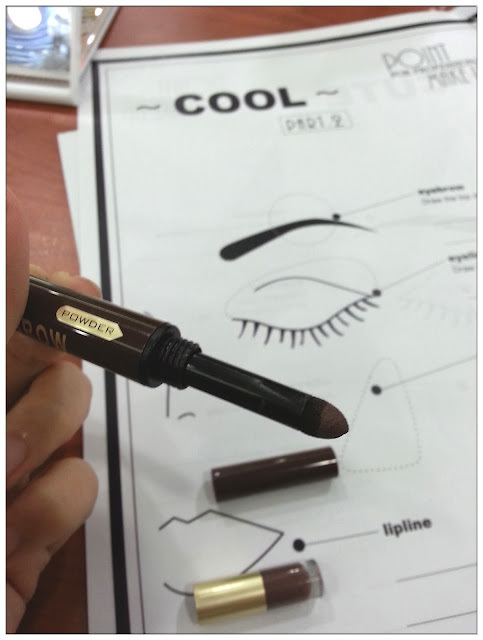 It is such an important step in defining a girl's make-up don't you think so? First time using K-Palette Lasting 2 Way Eyebrow. 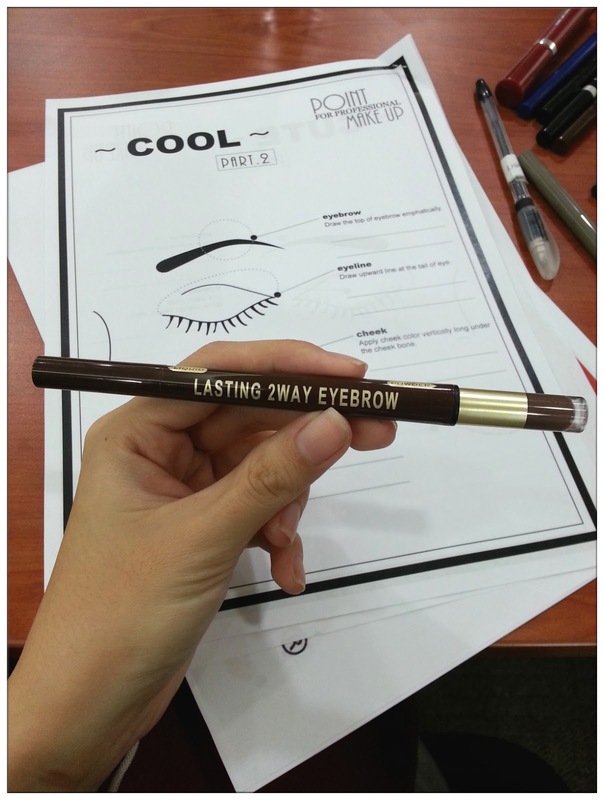 Comes with two type of tips, easy to draw and the define the eyebrows at certain area. For girls with cute face type, your eyebrows should be shorter, and for girls with cool face type like mine, the eyebrow can be longer. I prefer draw my eyebrows in thicker shape nowadays and I don't know why. I guess my drawing skill change from time to time. lol. See! 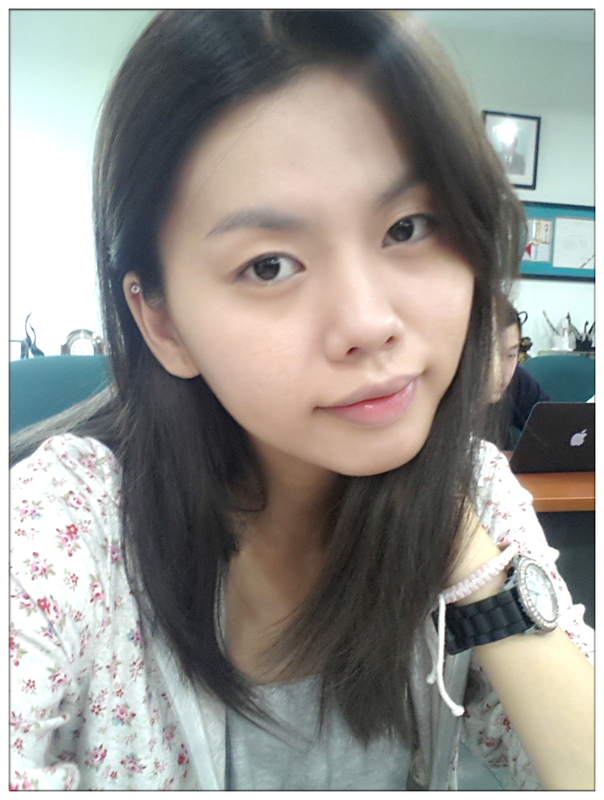 Eyebrow make a lot of difference to one's feature. After I drew my eyebrow, I feel kinda heart itchy to try on their eyebrow mascara, so while waiting for Inagaki-san to check and help draw other's eyebrows, I try and brush the eyebrow mascara onto my already drew brows, and it was a mistake! Put on way too many eyebrow mascara that they clumped together and my eyebrow looks dead and fake. Gotta remove my eyebrow make-up and do it all over again. LOL! A lesson for being hand itchy did something extra, and also made me realize how much I like the Lasting 2Way Eyebrow, so easy to draw and define my eyebrow shape in just seconds, I can draw layers and layers without my eyebrow looks like Crayon Shin-Chan's. Love!!!! 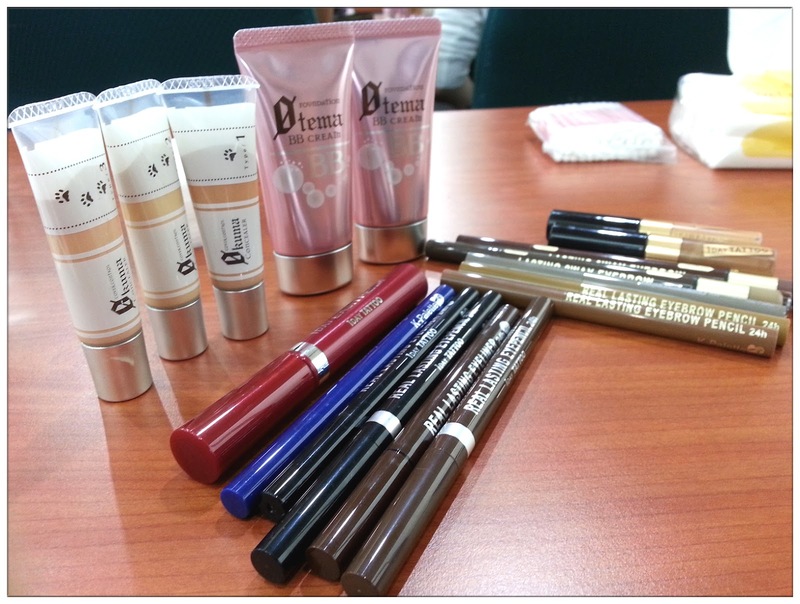 I can see that K-Palette really focus on eye make-up as they have tons of products cater for eye make-up needs. Next we're gonna do is drawing eyeliner, which is my favourite part during a make-up process. As usual, cool type face have to draw the line longer as for cute type face, shorter. 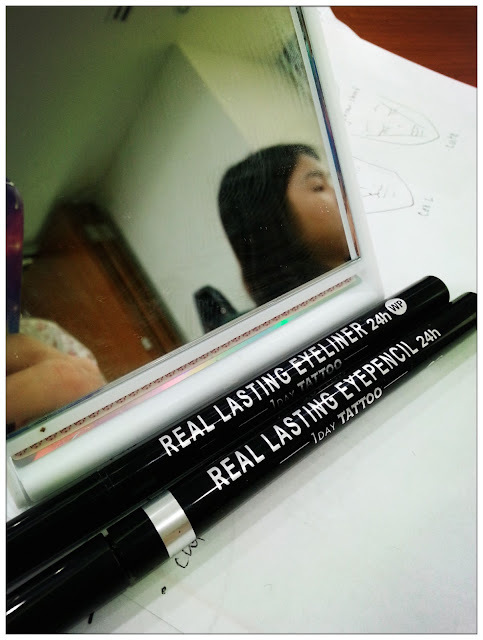 Yes, am gonna use that number one best selling eyeliner in Japan - K-Palette Real Lasting Eyeliner 1Day Tattoo! 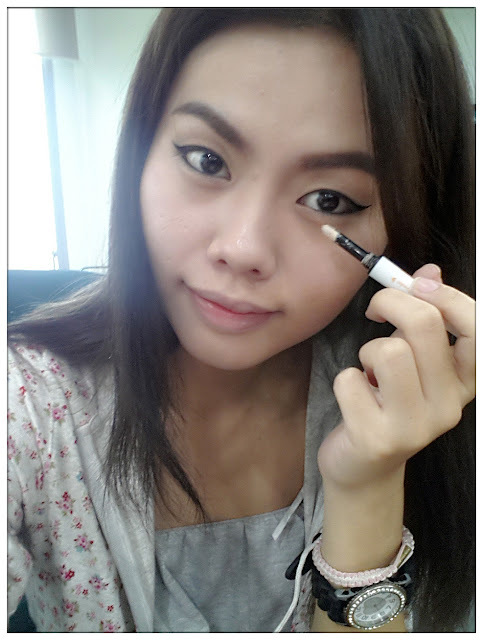 1Day Tattoo, gonna use both eyeliner and eye pencil. 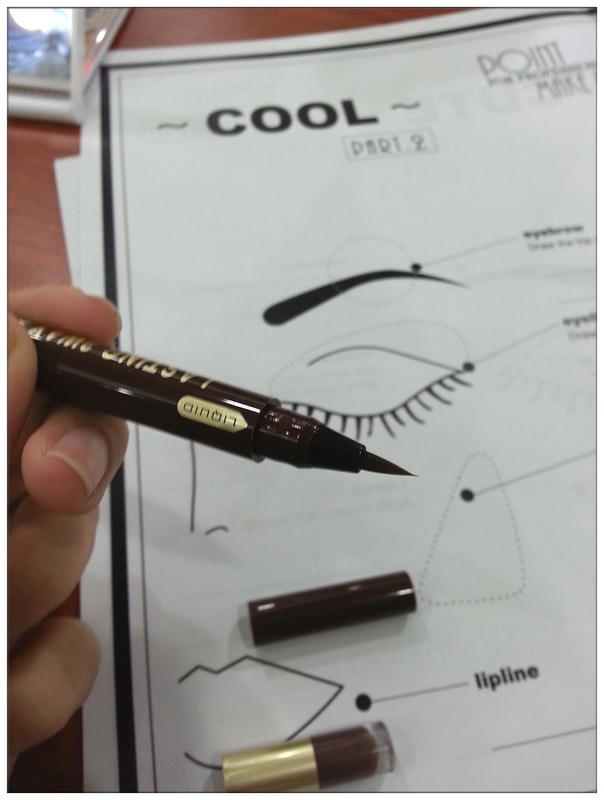 After trying out the eyeliner, I'm convinced why it is the number 1 selling eyeliner in Japan - Because it is so easy to use and non-smudge plus stay the whole day!!! 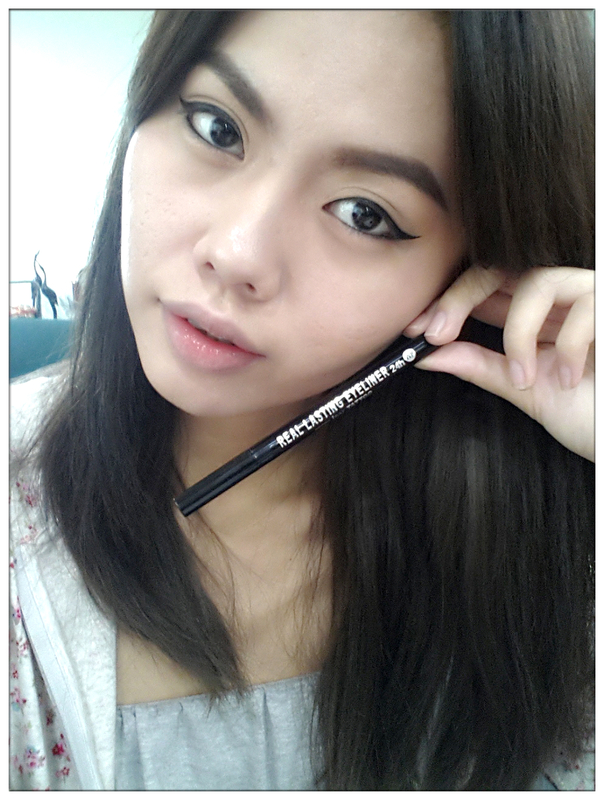 Can feel it is easy to glide through my eye lines when I draw using the eyeliner, its tip is sharp and of course, non-smudging for the whole day! Plus it can be remove using warm water, long-lasting stay but easy removal, sounds like heaven! 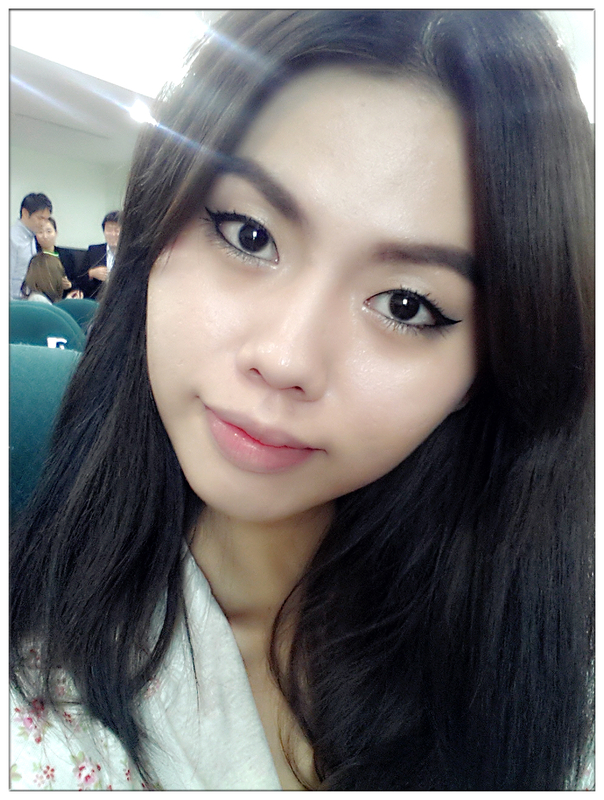 If you don't know, that eyebag make-up is the IN thing in Japan and Korea make-up trend now Now NOW!!! Everybody wants eyebag make-up, and the watery eye effect that eyebag make-up creates is so good that I bet all the guys wouldn't bully you for a single second! The creamy and highlighting effect of the Tears Tank 1Day Tattoo is really good! Normally, when I wanna do the eyebag make-up, I have to use highlight powder or white/beige eyeshadows and apply them on my eyebags. 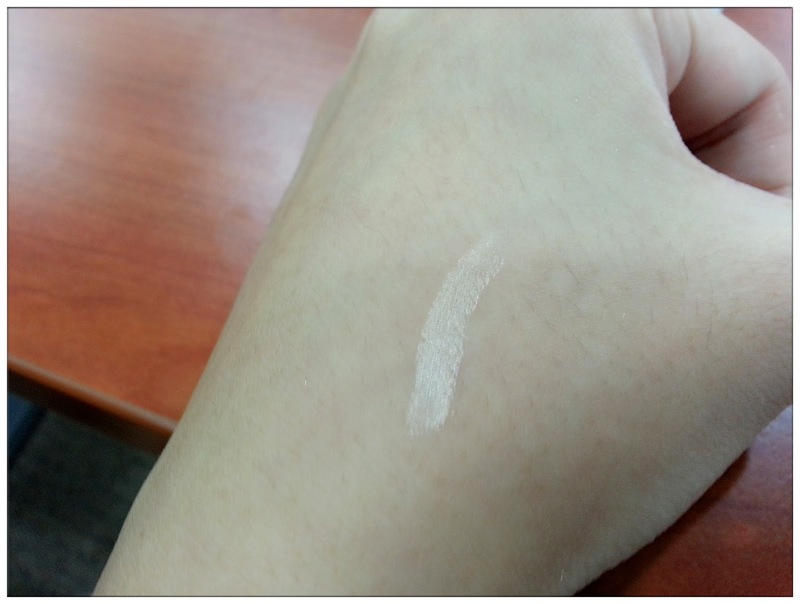 Of course it is quite inconvenient and sometimes the powder of the eyeshadows will drop into my eyes during the application process, it was a painful process to get it out from my eyes and irritates my eye so much. 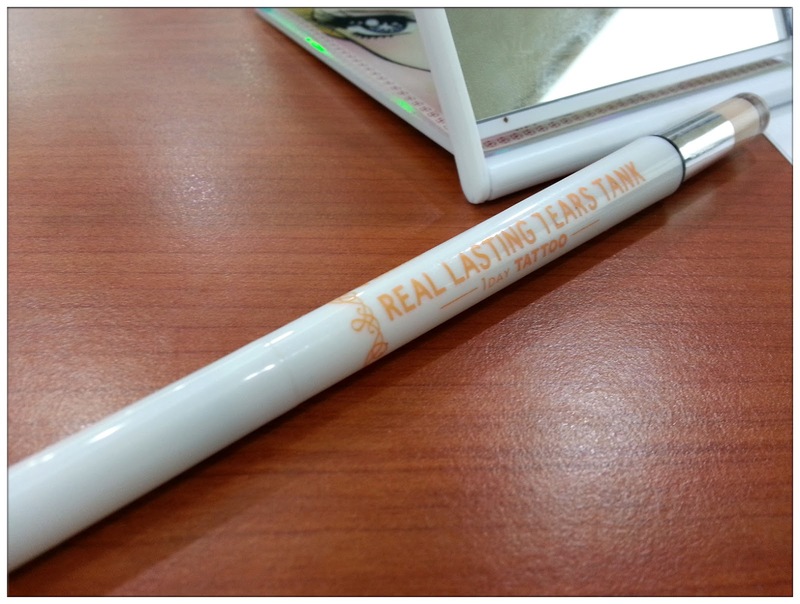 Now with the Tears Tank 1Day Tattoo, highlighting my eyebags is just an easy peasy process. After applying the Tears Tank 1Day Tattoo and 1Day Lash Perm Mascara, my look of the day is pretty much done! 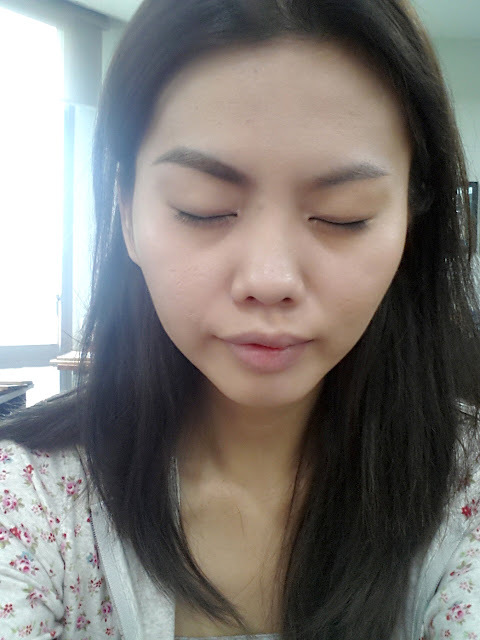 K-Palette's 1Day Lash Perm mascara really lengthens and curled my eyelashes without using eyelash curler! Both me and Jean were amazed by how it lengthens and curled my eyelashes, especially my lower eyelashes that looks so long and dolly after apply. Now, we're two Gorgeous sick cats. Hahaha. 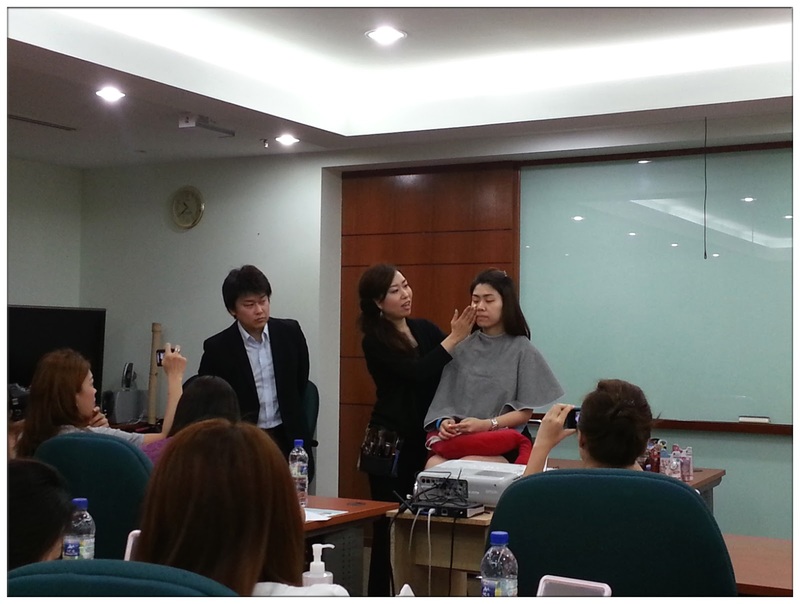 It was a really fun workshop learning from Inagaki-san and get to lay my hands on all the K-Palette's best selling products. Feels so much better after the workshop, maybe it's because I feel the confidence is coming back with my make-up done face. That's why, being pretty is not just about looks, but to boost our inner self-esteem that bring us positive attitude towards life! Thank you Mandom Corp., K-Palette and Manoah Consulting for organizing this wonderful beauty workshop that brought tons of fun and confidence back in me. Such a perfect start for a beautiful Sunday! Time to catwalk out the building and conquer the world!!! 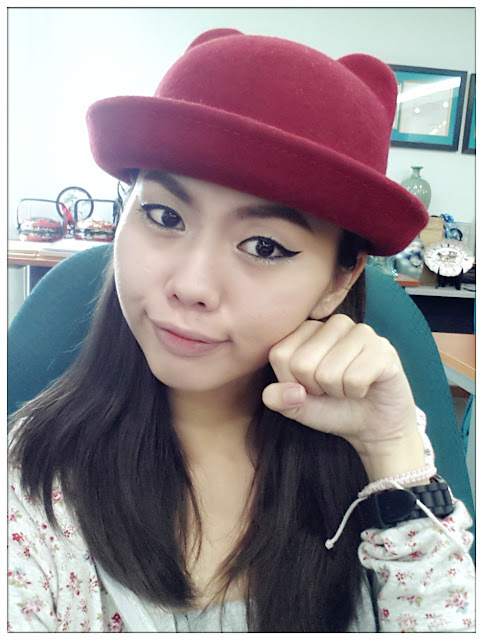 MEOW~!!! Last but not least, group pic time with Mr. Kinoshita, Ms. Inagaki and Mr. Suzuki!